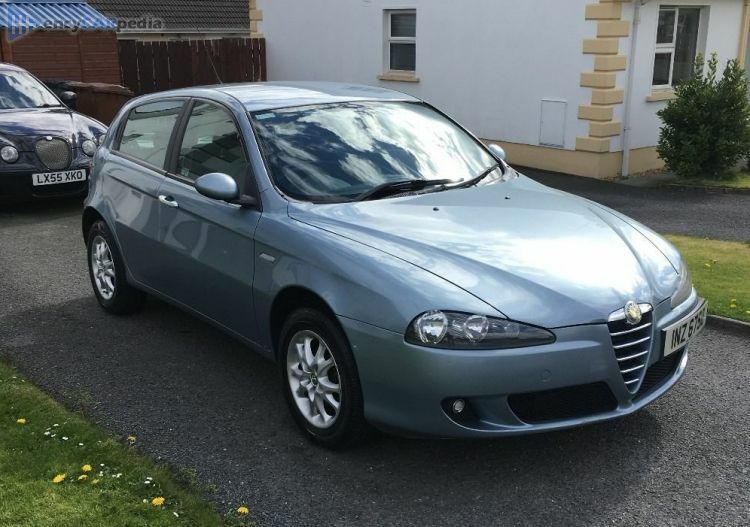 This Alfa Romeo 147 1.9 JTD 16v was produced from 2005 to 2009. It's a facelift of the 2003 Alfa Romeo 147 1.9 JTD 16v and was itself facelifted in 2009 with the 2009 Alfa Romeo 147 1.9 JTD 16v. It's a front-wheel drive front-engined compact hatchback with a choice of 3-5 doors & 5 seats. With 148 hp, the turbocharged 1.9 Liter 16v Inline 4 diesel engine accelerates this 147 1.9 JTD 16v to 62 mph in 8.9 seconds and on to a maximum speed of 129 mph. Having a curb weight of 3009 lbs, it achieves 40.6 mpg on average and can travel 642 miles before requiring a refill of its 15.9 gallon capacity fuel tank. It comes with a 6 speed manual gearbox. Luggage space is 10.3 cubic feet, but can be expanded to 36.8 cubic feet for larger loads.